1. Open iNote. After seconds loading, it should be like the left screenshot. If it keeps loading, you should check your internet connection. Though if you were in China, you would need a VPN to use our app. 2. Click “Start setup” to sign in Evernote. 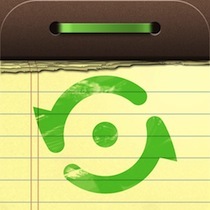 You can get a Evernote account here if you don’t have one. 3. Click “Authorize” after sign in. You have to renew this once a year. 4. Click Setup in the next step to begin Profile install. 5. Your iOS device would automatically download and open the iNote Sync profile, like the left screenshot shows. Click “Install” button. 6. Open Setting app on your iOS device, go to “Mail, Contacts, Calendars” setting as shown in the right screenshot. 7. Open “iNote Sync” account as shown in the left screenshot. 8. Make sure the “Notes” switch is on. You can switch of “Mail”. 9. Then go back Settings app, open “Notes” setting. 10. Make sure the “Default Account” is “iNote Sync”. It’s OK if you couldn’t find “Default Account” in Notes setting, it means you don’t have to change anything.